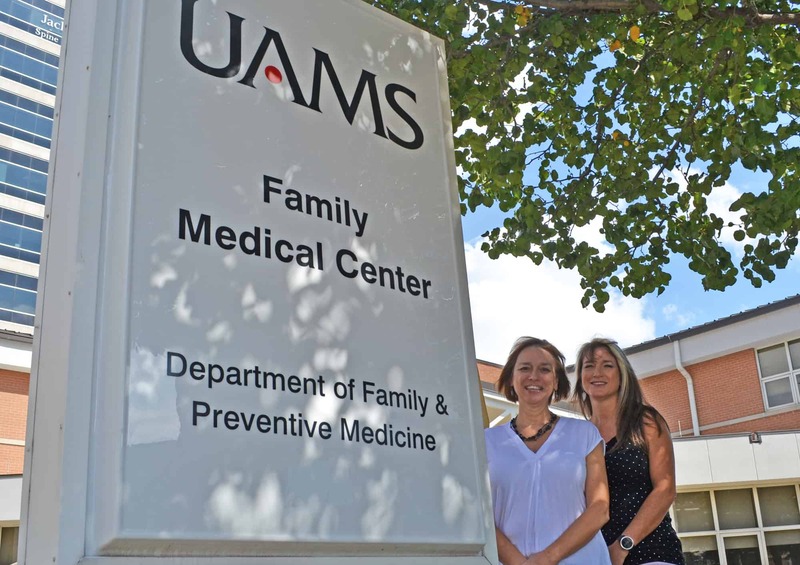 The UAMS Department of Family and Preventive Medicine has received a $3.29 million federal grant to reduce obesity in Arkansas. Alysia Dubriske (right), director of Community Health and Education at UAMS, is leading the grant. She is pictured with Leanne Whiteside-Mansell, Ed.D., director of the Research and Evaluation Division of Family and Preventive Medicine. Oct. 10, 2018 | The Department of Family and Preventive Medicine at the University of Arkansas for Medical Sciences (UAMS) has received $3.29 million from the Centers for Disease Control and Prevention (CDC) for a five-year project to reduce obesity, increase physical activity and improve nutrition in Arkansas, especially in the Delta. The State Physical Activity and Nutrition (SPAN) project funding began Oct. 1 and was awarded to the Department of Family and Preventive Medicine’s Community Health and Education Division. Alysia Dubriske, director of Community Health and Education at UAMS, is leading the grant. UAMS staff will be working in partnership with local leadership and stakeholders across the state, but especially in counties where life expectancy is lower than national and state averages. Many rural counties in the eastern Arkansas Delta fall into this category. Obesity, diabetes, high blood pressure, low physical activity, poverty and lack of access to health care are factors. Develop and implement food service guidelines for food pantries, early childhood education centers, developmental disability day centers and local parks. Support breastfeeding by partnering with family practice clinics, early childhood education centers and developmental disability day centers and by offering continuing medical education hours and early childhood center and developmental disability center professional development training. Partner with communities to create activity-friendly routes to connect everyday destinations by implementing local policies to include bike routes, sidewalks and trails that increase safety and access for all abilities. Implement nutrition standards and physical activity standards into early childhood education centers across the state by changing the Quality and Improvement Rating System in Arkansas to increase physical activity, increase nutrition and physical activity education to staff, and decrease screen time. Assisting Dubriske with the project are Christopher Long, Ph.D., senior director of Research and Evaluation at the UAMS Northwest Regional Campus; and Leanne Whiteside-Mansell, Ed.D., director of the Research and Evaluation Division in the UAMS Department of Family and Preventive Medicine, which is part of the UAMS College of Medicine. Bettie Cook, senior research administrator at UAMS, assisted with the successful grant application.